Be ready to tackle all kinds of situations and sudden shifts in weather conditions, let it be sudden downpour, harsh cold or warm spell, with this parka made of DRYEDGE 2L. Designed for women with an elegant yet sportive style, it is fitted yet not bold. 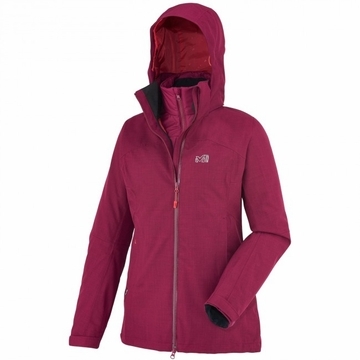 Its longer and covering fit will help you face the winds and static cold comfortably. Whichever activity you choose, it will adjust to both your body and the outside temperature to keep you warm and comfortable. The PERTEX/PRIMALOFT BLACK liner complements the shell protection. A regular length makes it look really good as a stand-alone piece and you can feel great about its thermal AND eco-friendly qualities. The sleek design is ideal for everyday use and you can join it to or remove it from the shell, using a zipper.